This is a wonderful property with an amazing LOCATION! Brand new listing in SW Cape Coral. Right on the Canal!! Close to shops, restaurants, just a short walk or bike ride away (5 blocks) although you may never want to leave the back yard! The pool and lanai are spectacular. 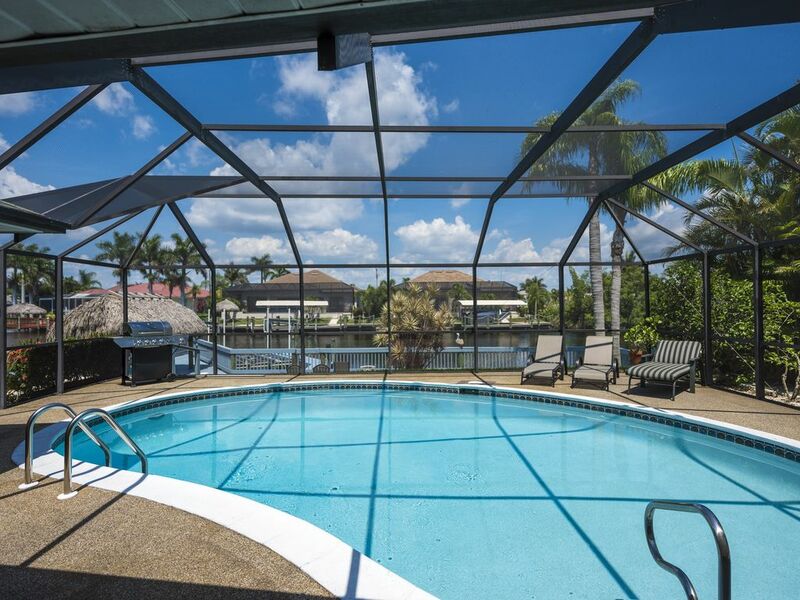 Very private backyard with a large dock spanning the entire width of the property. Fishing and relaxing are just a couple of things to do on the dock. We also provide 2 kayaks to take a trip down the canal to fish or just see the beautiful canal waterways and homes. Back home, the house is fully furnished with all the amenities of home- but your in paradise! Go out the front and enjoy a walk down the paved sidewalks down the road or take a stroll on the bikes also provided. This home will not disappoint all ages! My husband and I were married in 2003 and have since had 3 children. Nate owns a framing construction company in MN and I (Trisha) stay home with the 3 kids that we home-school. Because of these things, we have a lot of flexibility to travel and see this beautiful country, but we always come back to Cape Coral. We starting coming to Cape Coral in 2013 and we FELL IN LOVE!! This year we decided that we needed to own a little bit of this paradise. We have been so blessed with the time and memories of Cape living that we wanted the opportunity to share it with others. We bought this house and immediately got to work. We replaced the tile in the dinning room and kitchen. Rehabbed the lanai and pool area. Furnishing this home was very fun and exciting to make it homey and inviting. Among many many other things. We ALL worked to make this house a home! I can not wait for you to start making amazing memories here! Trish's house is spotless! This place doesn’t disappoint. We enjoyed the hot tub and pool. We went on several bike rides and went kayaking. You really don’t even need to leave the house, there is plenty enuf to do at the house. The location is perfect!!!!!! Trisha was really quick at responding. We really couldn’t have asked for a better getaway. The house was very complete. I would say it was home-from-home but it's better than my home with great weather, pool, air conditioning etc. If I was to make any suggestion it would be to have a kettle for us tea drinking brits and I think the cleaner should wash the floor between visitors. It was beautifully tidy on our arrival but the floor instantly made your feet and socks pretty dirty. Having said that, we loved the house, had a fantastic time and will recommend to friends. Thank you so much David for the suggestion of a tea pot. I will add that! Also I am very surprised about the floor. I will definitely let our cleaner know that it wasn’t perfect !!! That is what we strive for especially in the cleaning! Beautiful home in a great location. We will absolutely rent this property again! yay! We would love to have you again! Everything we hoped and prayed for! My children and grandchildren were here to attend a memorial service for their grandmother. This house provided them with a beautiful place to stay and large enough to accommodate all of the adults and children. The dock is a great place to gather, fish and kayak. The kitchen and dining room is wonderful for preparing large meals, entertaining., and extends out into the large lanai which has additional seating. The pool was used constantly, as the weather was hot. This was a great week to enjoy family time! Trisha was always available for questions and extremely helpful. We hope to rent again in the future! Wonderful home w/ lots of ammenities! Great host! Relaxing environment! This house is very beautiful, clean, and exactly like the photos provided! It is located in a very quiet and safe neighborhood, but still lots to do in the area. The hospitality was absolutely amazing! The host was very responsive to our needs! Unfortunatey the weather was not the best during our stay, but we still had plenty to do at the house itself because of all of its amenities. Pool and hotub worked perfectly! Very spacious dock with a beautiful tiki hut. They also provided a 2 kayaks and 2 bicycles that we were able to enjoy! We had a great time, and look forward to returning in the future. We are so glad you guys had a great time! Next time ☀️☀️☀️! We love to walk or bike down to the Marina for live music on Tuesdays and Friday nights. Get some GREAT food at Rumrunners or Fathoms. We have seen dolphins and manatee in the canal while eating at Rumrunners.